The GearWrench full polish combination wrench features a long pattern length. The GearWrench full polish combination wrench features Surface Drive Plus on the box end, which provides off-corner loading for better grip, reduced fastener rounding, and up to25% more torque. 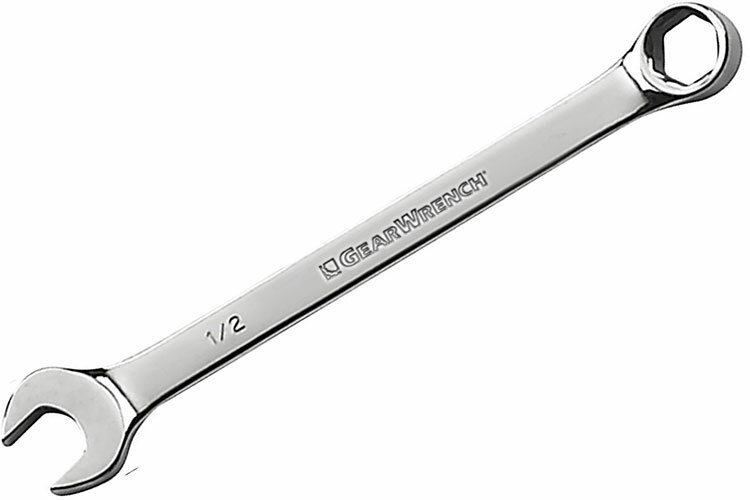 The GearWrench full polish combination wrench also features an offset box end for better access. This GearWrench full polish combination wrench is made from a premium alloy steel and is coated in a bright, full polish chrome finish. The 81773 GearWrench 1/2'' 6 Point Full Polish Combination Wrench is one of thousands of quality tooling products available from MRO Tools. Please browse GearWrench 6 Point Full Polish Combination Non-Ratcheting Wrenches for tools similar to the 81773 GearWrench 1/2'' 6 Point Full Polish Combination Wrench. 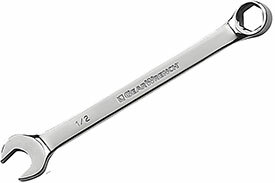 81773 GearWrench 1/2'' 6 Point Full Polish Combination Wrench description summary: GearWrench 1/2'' 6 point full polish combination wrench Fastener Size: 1/2'' Point Size: 6 Point Open End Width: 1.051'' Open End Thickness: 0.252'' Ratcheting End Width: 0.780'' Ratcheting End Thickness: 0.335'' Overall Length: 8.114'' Quantity discounts may be available for the 81773 GearWrench 1/2'' 6 Point Full Polish Combination Wrench. Please contact MRO Tools for details.